高峰, 卢伟龙, 王华林, 吴媛媛, 王斌, 李敏. 大鼠背根神经节细胞中TRPV1与cAMP/PKA通路调控机制研究[J]. 中国药理学通报, 2018, 34(8): 1110-1113. GAO Feng, LU Wei-long, WANG Hua-lin, WU Yuan-yuan, WANG Bin, LI Min. Study on regulatory mechanism of TRPV1 and cAMP/PKA pathway in dorsal root ganglion cells of rats[J]. Chinese Pharmacological Bulletin, 2018, 34(8): 1110-1113. Abstract: Aim To investigate the regulation of TRPV1 and cAMP/PKA signal pathway in rat dorsal root ganglion(DRG) cells. Methods Primary cells of rat DRG were isolated and treated with 8-Br-cAMP and H-89, agonist and inhibitor of cAMP/PKA signaling pathway, capsaicin and i RTX, agonist and inhibitor of TRPV1. The expression of TRPV1 and p-PKA in each group of cells was detected by qPCR and Western blot. The regulatory mechanism of TRPV1 and cAMP/PKA signaling pathway was explored. 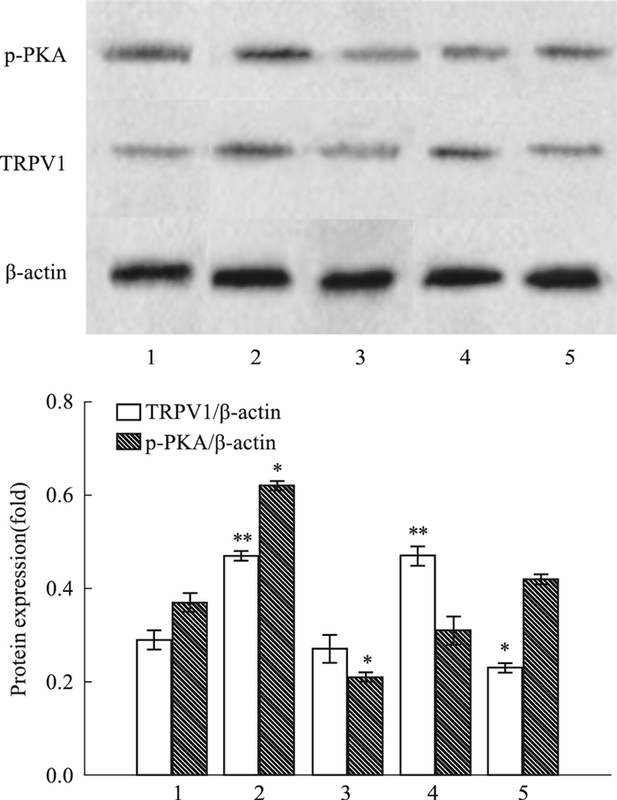 Results Compared with the blank control group, the gene and protein expression of TRPV1 in capsaicin group significantly increased, while the gene and protein expression of TRPV1 in i RTX group significantly decreased. However, the expression of p-PKA gene and protein showed no significant change. The gene and protein expressions of p-PKA and TRPV1 in 8-Br-cAMP group were significantly enhanced, and the gene and protein expressions of p-PKA and TRPV1 in H-89 group significantly decreased. Conclusions The cAMP-PKA signaling pathway is one of the most important mechanisms regulating the expression of TRPV1. At the same time, other signaling pathways may have some regulatory roles in TRPV1. Fig 2 Expression of p-PKA, TRPV1 in different groups 1: Control; 2: 8-Br-cAMP(50 μmol·L-1); 3: H-89(20 μmol·L-1); 4: Capsaicin(25 μmol·L-1); 5: i RTX(2 μmol·L-1). *P < 0.05, **P < 0.01 vs control. 王乐, 王兰兰, 曹宇. TRPV1对LPS致热大鼠体温及下丘脑中Ca2+浓度和cAMP含量的影响[J]. 中国药理学通报, 2009, 25(1): 51-5. Wang L, Wang L L, Cao Y. Effects of TRPV1 on LPS-induced fever and the content of Ca2+ and cAMP in hypothalamus in rats[J]. Chin Pharmacol Bull, 2009, 25(1): 51-5. 李敏, 王羲雯, 程丽飞, 等. 基于热敏感蛋白TRPV1的温热药性表达研究[J]. 中药药理与临床, 2016, 32(4): 49-53. Li M, Wang X W, Cheng L F, et al. The study of warm properties based on the heat sensitive protein TRPV1[J]. Pharmacol Clin Mat Med, 2016, 32(4): 49-53. 李晓丽, 张石波, 孙晓婷. 大鼠背根神经节神经元原代培养中纯化方法的改良[J]. 南通大学学报(医学版), 2015, 35(4): 257-60. Li X L, Zhang S B, Sun X T, et al. Improvement of the purification methods for primary culture of neurons from dorsal root ganglion of rats[J]. J Nantong Univ(Med Sci), 2015, 35(4): 257-60. Chinese Pharmacological Bulletin, 2018, 34(8): 1110-1113.